This is another great recipe from Gooseberry Patch's cookbook, 101 Super-Easy Slow-Cooker Recipes Cookbook . The seasoning on the pecans is a tad spicy which makes them great to serve at Super Bowl Parties, Final Four Parties, Grammy Parties, Tailgating, or just to snack on anytime! I think they would go great with beer too...just sayin'! And better yet, you make them in the crock pot. 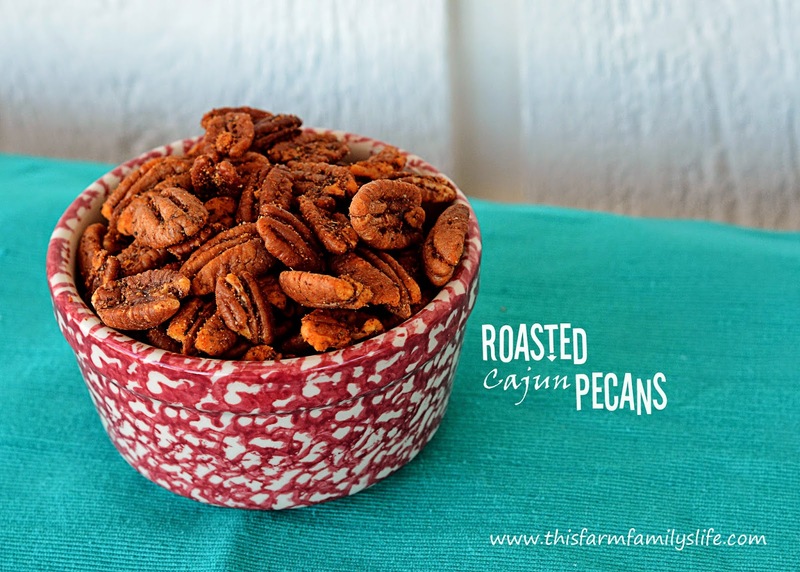 Who knew you could roast pecans in the crock pot? Not me! Well, I guess I never gave it much thought until I saw this recipe. This was the first thing I made from this awesome cookbook! 1) In a small bowl, mix together spices. 2) Pour melted butter into a slow cooker; stir pecans until evenly coated. 3) Sprinkle spice mixture over pecans, stirring constantly, until evenly seasoned. 4) Cover and cook on high setting for 12-15 minutes, stirring once. 5) Remove lid from slow cooker and reduce heat to low setting. Cook uncovered for 2 hours, stirring occasionally. 6) Remove pecans from slow cooker; cool on paper towel-lined wire rack.